Sorry for the long periods betweeen reports. The fishing over the last few days there were mixed with some great but some with not so great days. We’re still waiting for summer to arrive so we can get started with the Vancouver salmon fishing season. 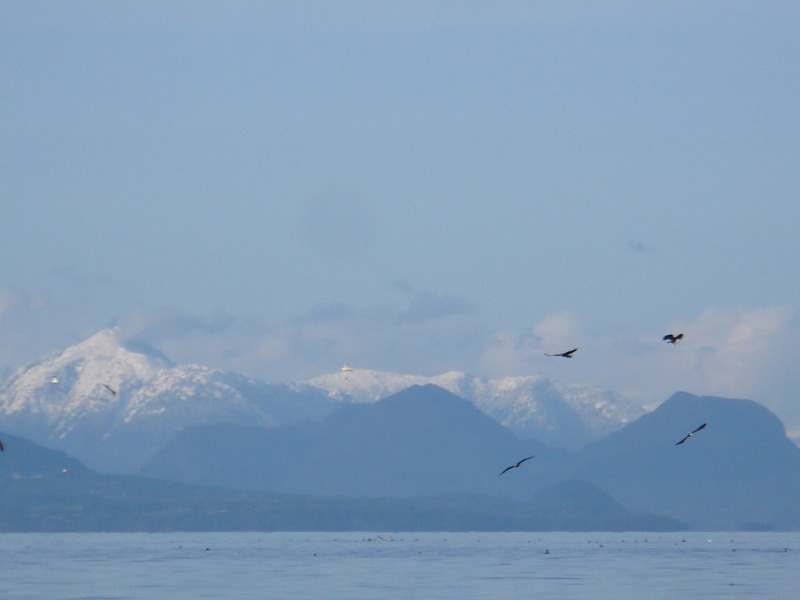 The Gulf islands around the area of Thrasher still report red hot or for some people cold. I know a lot of boats that were limited out with one boat catching 8 with several others with 4 or 6 but there were also a lot of boats with 1. They were in pockets and if you hit one of the pockets you did great. Most of the springs were betweeen 12 and 18 pounds. This side of the strait closer to down town Vancouver has had mixed reports also. 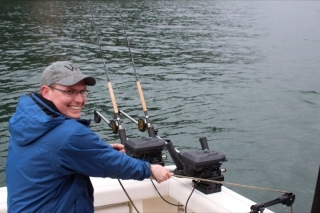 The Capilano river has a bunch of Coho in it in the next week or so if it doesn’t rain there will be good fishing on the West van shoreline for Coho and a few Spring salmon. 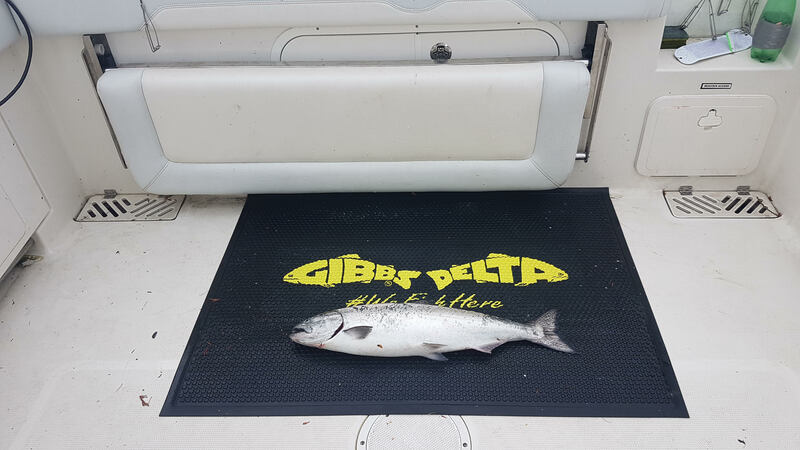 Howe Sound over the last few days has been producing also with Grace islands, hole in the wall and Defence islands producing some nice Springs up to 20lbs. One boat at Defence got 4 nice ones on Saturday, the biggest being 19lbs. A good week over all if the water stays nice and calm and we fianlly get some summer weather it’s looking like a good month in front of us. Until next time good luck if you need any questions asked feel free to call and i will help you out any way i can. Finally some sun 2 days in a row. 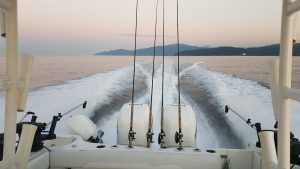 The best fishing in vancouver is still to head to the gulf islands for a full day trip. The best fishing seems to be at Thrasher Rock to a few miles out and up to the Grande. Alot of boats are still getting there limits if they hit the pockets of fish and most of the fish seem to weigh in the teens. 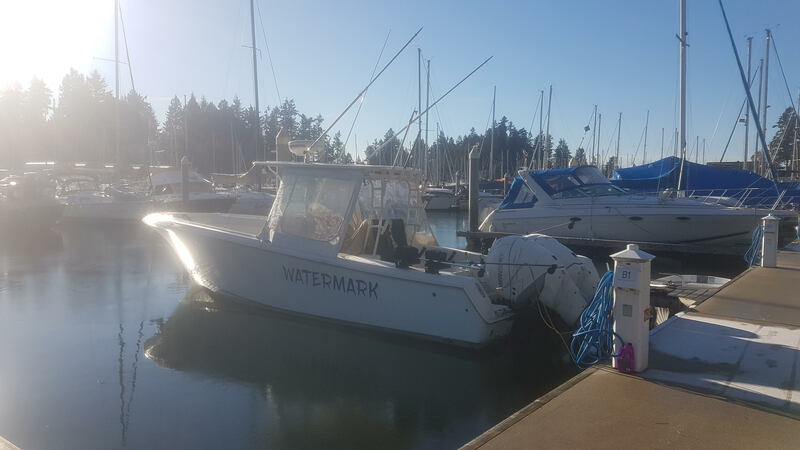 Its a great day to go over to the Gulf islands and with Watermark being 34ft if the wind blows up we will still get a nice ride home and we just turn the heat on. This side of the Strait it has slowed down a bit the South end of Bowen island has slowed down and usually does at this time of year. 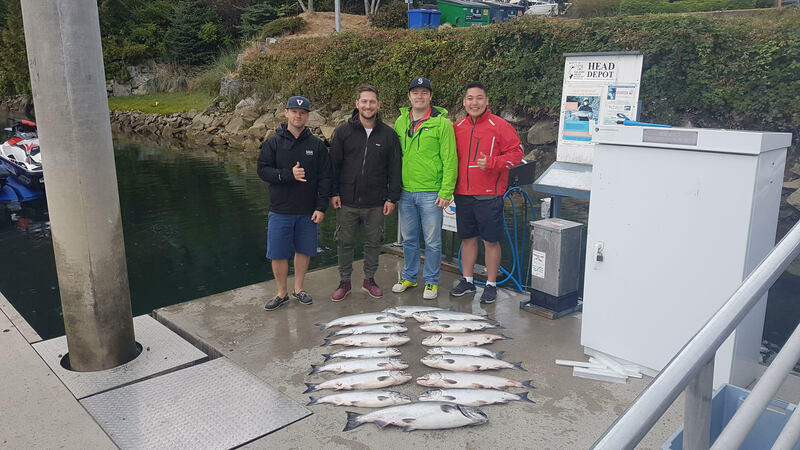 Howe Sound has produced some nice fish at Hutt, Defence islands, Porteau Cove, and Hole in the Wall in the last week and most fish weighing in the teens with the biggest i know of being in the low 20’s. 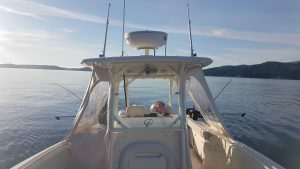 I will be out a lot this week with a weekend in the Gulf islands and a couple days in the week so till the next report good luck. If you need to book a charter or get any other info you need about Vancouver i would be pleased to help. Have a good few next days. Well today we headed out on a charter, it wasn’t supposed to be the best day, but when we got to the South end of Bowen island we realised it was calm and the weather report was wrong. We headed over to Thrasher rock in the Gulf islands. It was worth it, as it was the best day of fishing of the year so far. We only fished 3 rods 143ft, 163ft, and 183ft one with a spoon, hootchie, and an anchovie. It didn’t matter what rod or lure they all got hit. We limited out very quickly with 4 nice Springs weighing betweeen 12 and 18lbs. After we limited out we realeased 4 more nice Spring biggest one being around 18lb and smallest about 13lbs and had 6 other ones on. We only had one undersize fish. 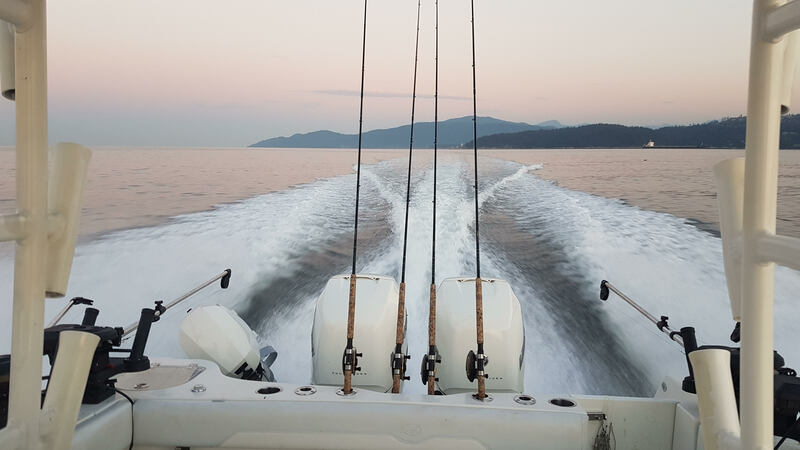 We stopped fishing around 1230 after it had started to flood and the bait seemed to disappear and headed back over the the Straight of Georgia to Howe sound. We checked the prawn traps and did very well then headed into horseshoe bay. It was the best day of the year for us but has been very good over there for the last couple weeks or so. 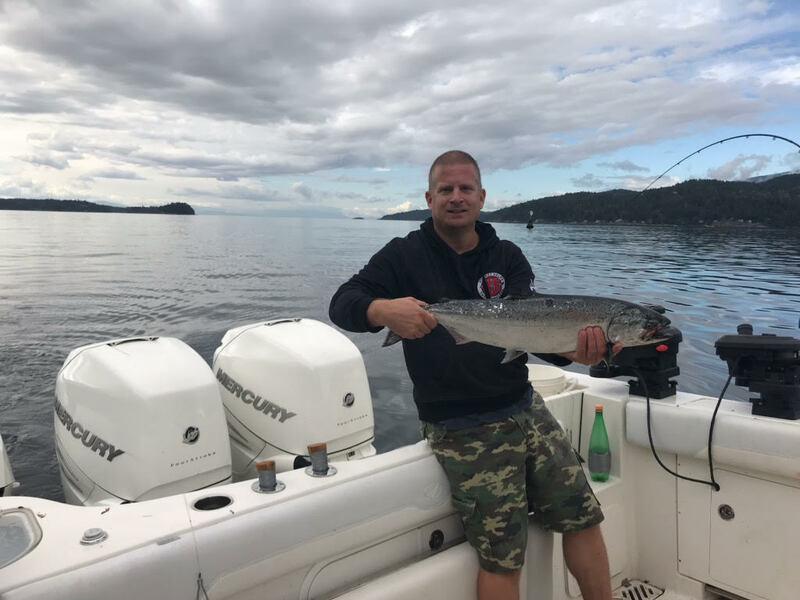 The South end of Bowen has still been producing some nice Springs also and there has been a rumor that some big fish have caught up Howe Sound. The next week looks good and the weather is going to get better for the long weekend so good luck till next time. Wow some nice weather finally hopefully this is the start of Spring in Vancouver. 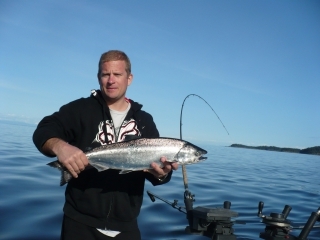 The vancouver fishing has still been abit slow but the weather has not helped much at all. 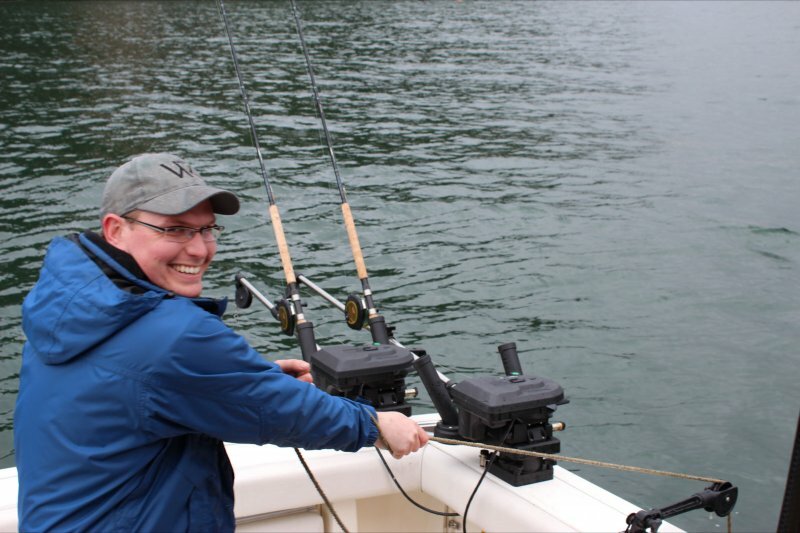 Hopefully now the weather will let the Vancouver salmon fishing season really begin. 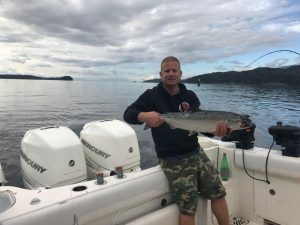 In the last week not many people have been out fishing but Defence and Poteau Cove has produced a few fish for the few people that have ventured up Howe Sound. 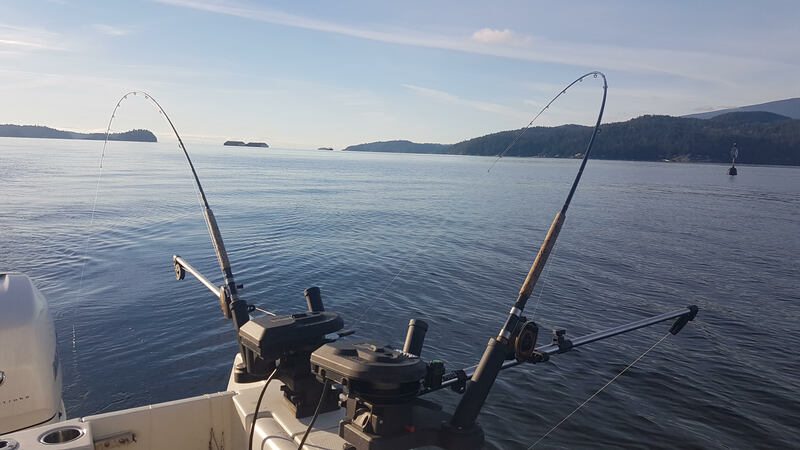 The South end of Bowen, which everyone has been waiting for, has still been slow but with the weather and the water conditions it has not been fished very much. The West side off Bowen island Tunstall, 3rd marker, Hutt, Grace islands a few fish have been caught. The Gulf islands a few fish have been caught off Thrasher rock which is a great. If this weather stays nice and it warms up we should see the fishing pick up quite quickly. Great way to start the 1st charter of the season. Had a 3 people from P.E.I on there first Vancouver salmon fishing charter. 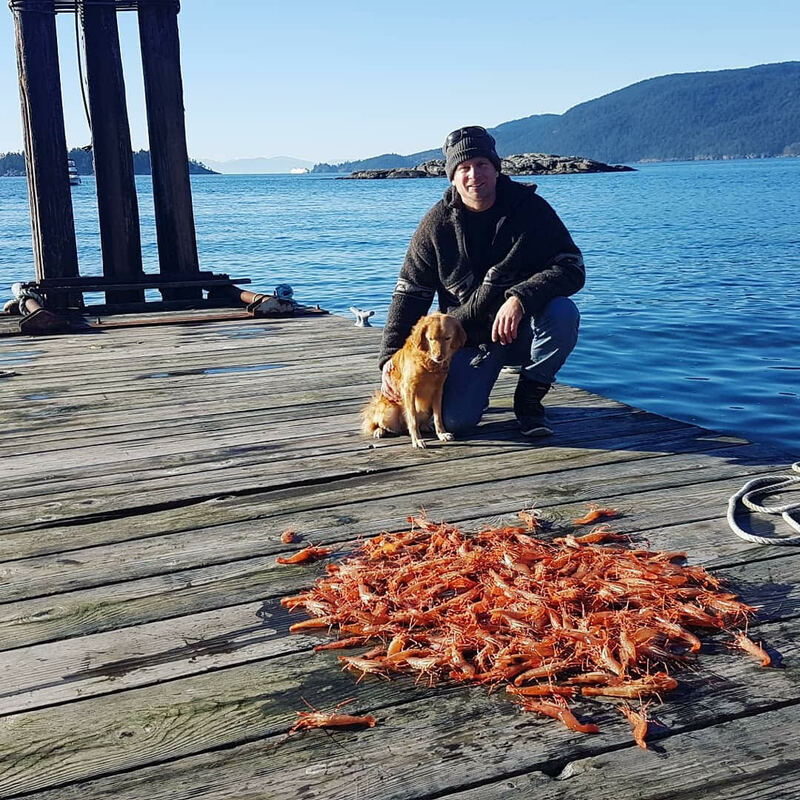 We started the day off with checking the traps that had been left out in Howe sound the day before, we got 6 legal dungeness crab and 400 prawns, a great way to start the day. 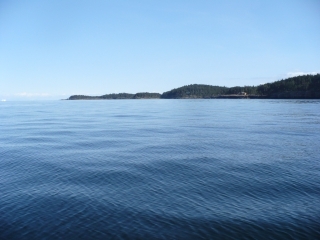 We then headed over to the West side of Bowen island and started at 3rd marker before the high slack. We lost a small Spring salmon in the first half hour but nothing else. 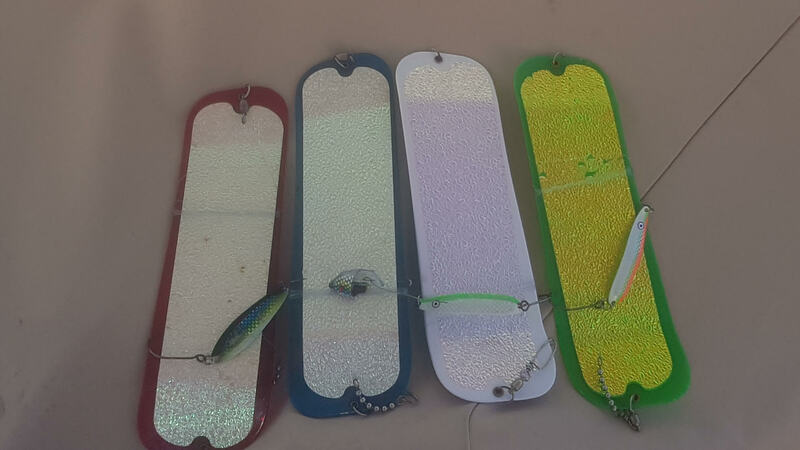 When the tide started to slow down near the high and the bait came into the area we hit a 16lb Spring dragging the bottom on an army truck spoon. Soon after we hit another 14lb Spring on the same thing dragging the bottom right off the cabin at 3rd marker. We trolled around for another hour the bait seemed to move on and a couple seals moved in also we called it a day and headed back to deal with the days catch. A good way to start the charter seaon the water was flat calm and didn’t rain till the last hour or so of the charter. Until next time good luck. 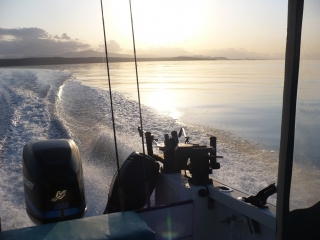 Don’t forget to send us an email or give us a call if you would like to arrange a charter. 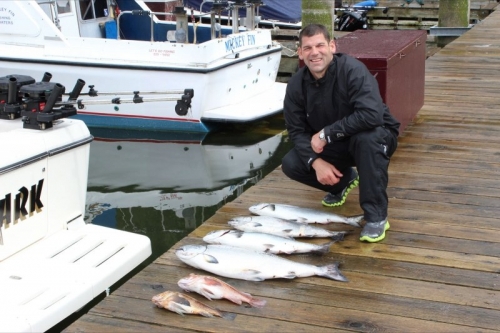 The fishing has picked up quite abit in the last few days around vancouver. In the last few days there have been some fish caught in English Bay, the Bell Buoy, the South end of Bowen, and Grace island. Hopefully the last few days is the start of our Spring fishery. English bay off the Capilano to the Dundarave peir on the flood has produced a few nice Spring from being just undersize to the mid teens. The Bell Buoy there were a few more smaller undersize fish with a few legal fish in the 8 to 14lb range. In Howe Sound at Grace island a boat had a few good hours there losing a nice fish getting a nice fish and two undersize fish also. The South end of Bowen island it seems the better luck has been a mile or two off Cowans to Roger Curtis. 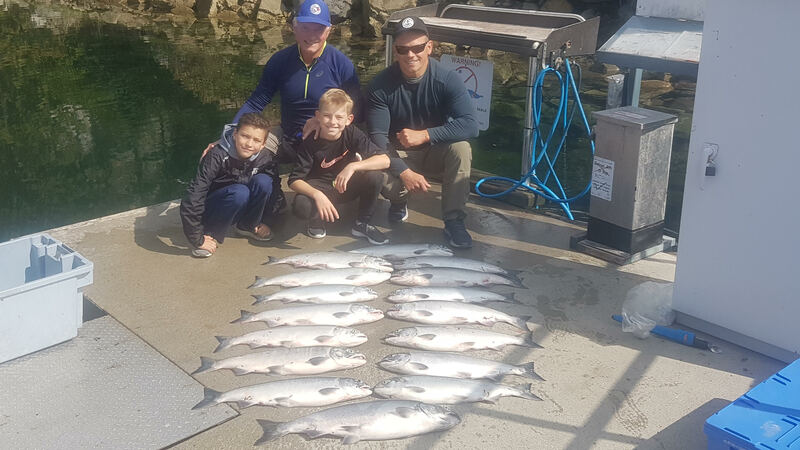 The fish here have ranged in size from just legal to about 15lbs with one boat yesterday getting three legal and losing two other good ones in a short time. The Gulf islands seem to have picked up abit also so everything seems to have started. This is the time of year we go out one day and we get busy it seems to be heading that way it usually happens in mid April. If you have any questions feel free to call and you’ll get an honest answer have a great day. 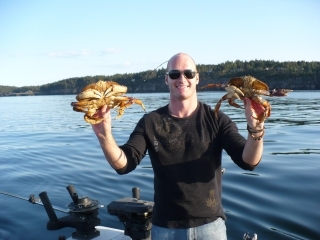 did well with a good number of large Dundeness crab. The fishing should just get batter hopefully the weather stays like it was today and we’ll be able to get across the straight and to fish off the South end of Bowen Island. If you have any questions feel free to call until next time good luck. Another couple stormy days in the greater Vancouver area. The good news is in the last 4 or 5 days when people can get out in this weather there seems to be alot more feed showing up. There seems to be feed showing up at Hole in the Wall to Lions Bay when this weather calms down there should be some Springs to be caught. There also is some feed showing up at the usual spots on the West side of Bowen Island, 3rd marker, Tunstal, and Hutt island. I did know one boat that did get for an hour or so of fishing at Grace island and did manage to get a 10lb Spring before he got blown out of there. The prawning and crabbing remains very good. Hopefully this weather blows itself out and we get some settled weather and fishing should pick up quite quickly. It’s very close to the time of year we start to fish the South end of Bowen island. 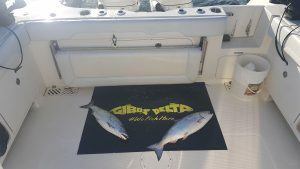 Should be some great fishing there are some blue backs which are small Coho salmon already are in the Stait Of Georgia. If you want any questions answered feel free to call and ask I’ll help you out any way I can to make your visit more enjoyable to Vancouver. The fishing has picked up on the west side of Bowen in the last few days. 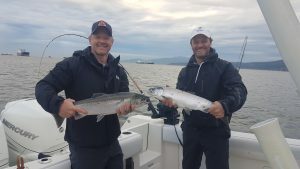 The Spring salmon fishing in Howe Sound on the west side of Bowen island has picked up at Grace Islands, Hutt Island, and 3rd Marker. The weather has been on our side and some nice Springs in the 8 to 16 pound range have been caught there also have been quite a few undersize fish caught also that range in size from 5lbs to just undersize. 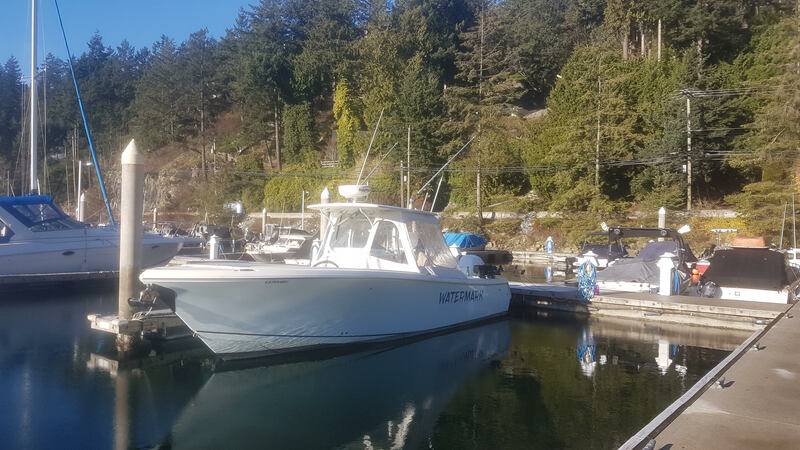 It should just keep getting better as the Spring moves on and we’ll start fishing off the South end of Bowen Island to the Gulf Islands soon. Crabbing and Prawning remains great. Until next time good luck. For the people that went out in the weather today it paid off. 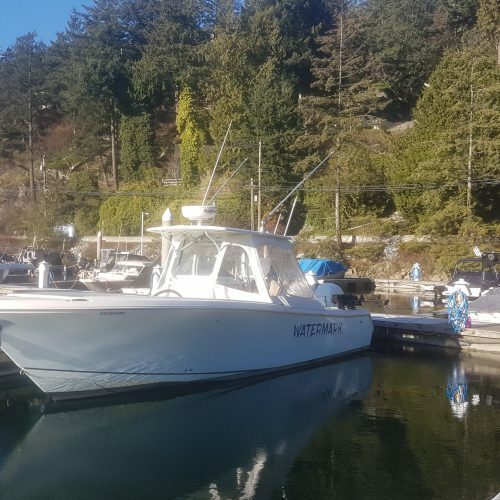 The one boat i know that fished the west side of bowen island at Hutt island, and 3rd marker got rewarded today. They ended up getting two Winter Springs a 13lb, 9lb they also got 2 just undersize and lost one. The weather was windy and rainy but it turned ouy yo be worth while. Hopefully the weather turns to the better and we will all get out there and get a lot better idea of how the fishing is. Untill next time good luck and it should start picking up later on in March. Well Spring time seems to be here. Fishing this winter was decent one day then slow the next day. There wasn’t that much feed around this winter if you found feed you usually picked up a few nice winter Springs. The Crabbing and Prawning this winter has been nothing short of amazing this should continue for both till the comercial prawning starts usually some time in June. 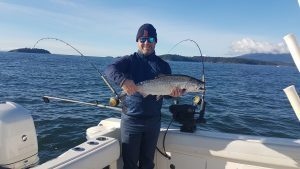 This is the time of year in Vancouver we start to get a good number of Spring salmon showing up in the Straight of Georgia, Off the Fraser River, in Howe Sound, and for full day trips the Gulf Islands. The Herring have moved into the Straight to spawn in good numbers and the Spring salmon are usually not far behind. In the last week or so there have been a few Springs caught off Point Grey to the North Arm mostly just undersize with a few nice ones mixed in. The West side of Bowen seem to have bigger fish with some nice fish getting caught at Hutt Island, 3rd Marker, and Tunstall Bay. 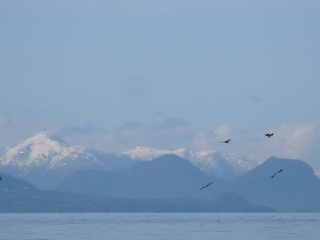 The South end of Bowen island starts to heat up at the end of March and goes till May. 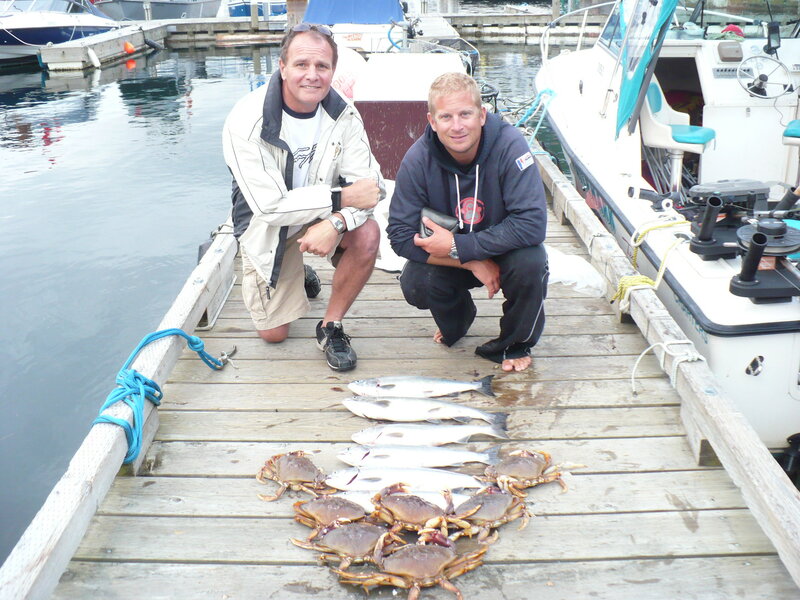 The crabbing in Howe Sound remains great all year round there’s no commercial fishery for them at any time in this area. This is the time of year everybody puts there boats back in the water and the marinas turn from ghost towns to full of boaters. They’ll be alot more people out fishing in the next few weeks so we’ll get a lot better idea of where the fish are and what they’re eating better having 100 boats spread out everywhere fishing to 10 or so boats fishing in the winter. Till next time good luck and if you have any questions email me and i’ll be glad to help you out the best i can. Should be a great year lets all hope the summer was as nice as the winter. 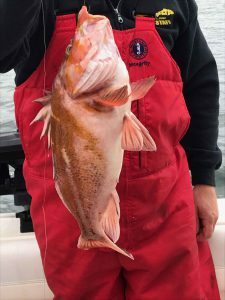 The Winter Spring fishery has started to get better and with this nice warm weather what a great way to spend a day on the water. Fishing in English Bay on the flood tide from the Capilano river to 25th street seems to be producing a few undersize and legal fish. 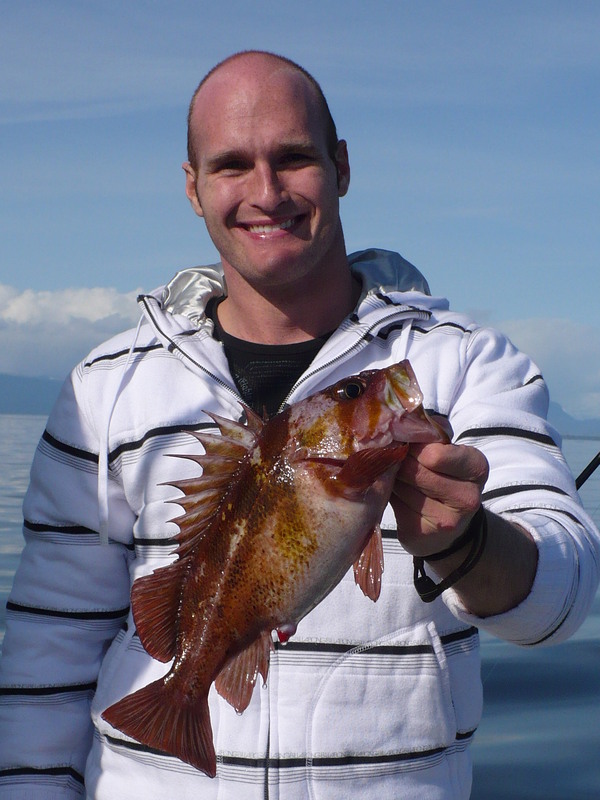 The west side of Bowen island Tunstall, 3rd marker, and Hutt island have produced some nice fish in the last week. 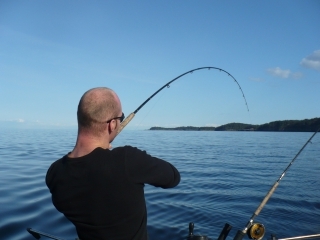 The fishing usually heats up at this time of year as the Herring start to move into the area. 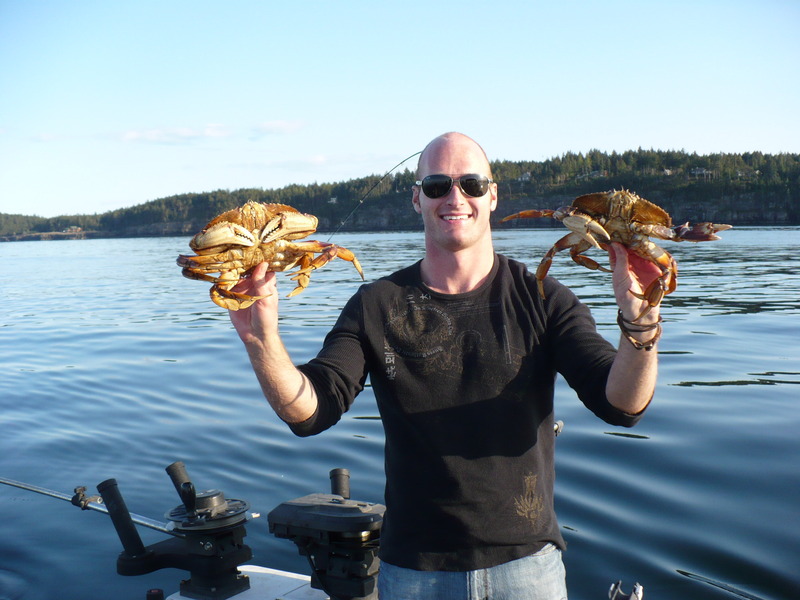 Crabbing has been great for Dungeness crab. Prawning has been great also. For fishing at this time of year a 6hr charter is perfect it’s just the right amount of time to explore Howe Sound. If the weather stays this nice we should have a great couple of weeks on the water over the Olympic games. The start of the winter fishing has started with some good days. Been fishing the West side of Bowen at Hutt, 3rd marker, and Tunstall. Most days depending on the tide some nice feeder Springs have been getting caught. With the weather mot been that great in the last week with wind it’ll be interesting to see how those spots produce this is the time of year we start to do quite well for fish. The crabbing and prawning have been great. It has been another nice couple of days fishing in Vancouver. It looks as though the last of the Pinks have disappeared from up Howe Sound and headed toward the Squamish River. We have had a great couple of weeks fishing for Pinks while using our light tackle. 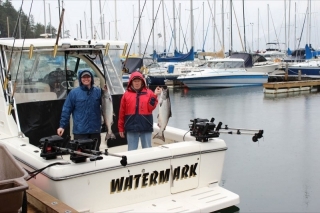 The Spring salmon has started to show up off of the Fraser river and also in English Bay. We have seen some Pinks, Sockeye, and Springs produced at the Bell Buoy in English Bay as well. Furthermore, there have been a couple of Springs caught off of the West Van shoreline on the flood tide. Moreover, there have been sightings of some Springs and Pinks off of the Fraser River from t10 to the South arm. We had a great day on the water Monday morning, where we ended up with a 30lb and 16lb Spring. That same day, we lost a Spring in the mid 20’s and released one that was just short of being considered legal size. 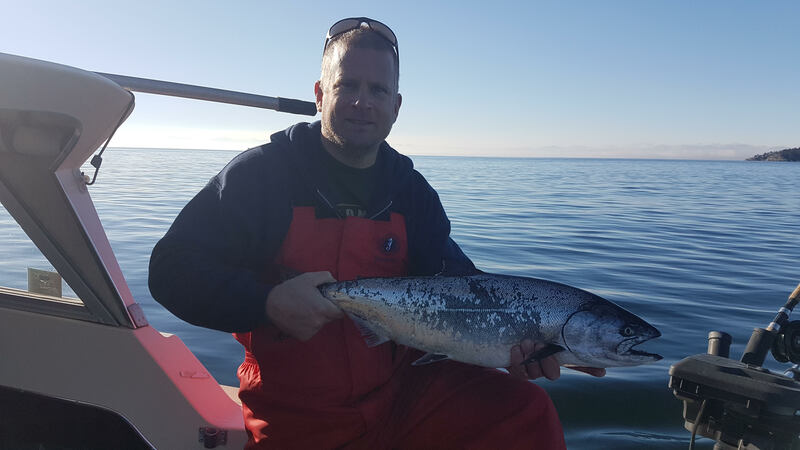 It was near the end of august of last year when the late run of Spring salmon arrived. Fishing looks good so far, and should only get better over the course of the next week or so. We can only hope that the killer whales stay away. As always, crabbing remains a success! Wow, was it ever a rainy day on the water! I had a group of guys that wanted to brave the rain so off we headed up Howe Sound to Camp Potlatch. We fished for 3 hours in the downpour and with a little luck we caught a Pink. We also lost one and had another hit. 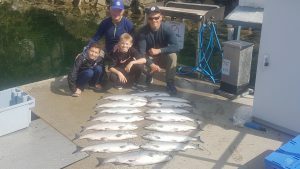 We then got a call that there were a little school of Pinks off of Furry creek. We got there and fished for about 15 minutes and limited out. They then disappeared. 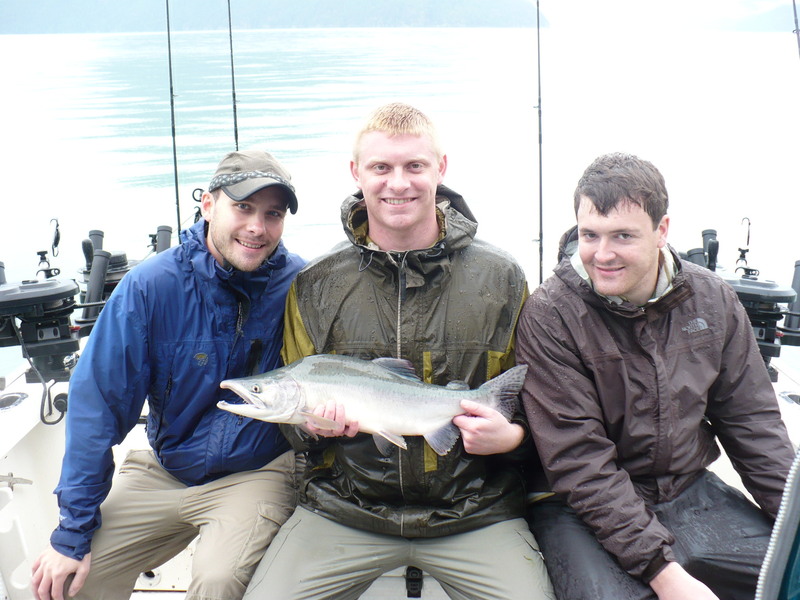 The Pinks are starting to hump up and are definately moving up towards Squamish river. In the harbour there were a few Springs taken for those who braved the rain. Friday was alot nicer of a day. We headed up the Sound in the afternoon. The people that fished the morning in English Bay at the Bell Buoy, had a few Springs and an odd Pink. We went and looked at Furry and saw nothing, so we headed up to Potlatch. At first we saw nothing, however, just before we left, we saw a little school of Pinks off of the creek. We ended up with 6 Pinks and we released a couple again. Some of them had very big roe in them already. They are definately headed up to the Squamish river. The next fishery should be very soon if we don`t get any more fresh Pinks up Howe Sound. There are still the Fraser Pinks to come also, and then we have our Springs still to come. These should be showing up at the Bell Buoy and then the Capilano Springs. Alot off great fishing ahead still just need things to dry up for us.